Like most folks, I met Cornelia Walker Bailey—a dark sturdy trunk of a woman, handsome and regal—when I first set foot on the exquisite spit of land, 11 miles by 4 miles, that sits nestled in the lush marshland off the coast of Georgia. One of the things that impressed me the most about Cornelia, and many islanders of her generation, is how deeply well she knew her surroundings. She knew Sapelo Island—its flora and fauna, its sea life and tides, its weather and soil—like nobody’s business. She knew the island’s history and was determined to get it straight. As the unofficial griot (a West African term for a historian or storyteller) of Hog Hammock, the last remaining of the five original African American communities on Sapelo founded by the island’s population of freed slaves and their descendants, she taught it every chance she got. Although she actually laughed in her deep, rich voice at the idea that her or anyone’s enslaved ancestors had the privilege and leisure to sit and make decorative grapevine wreaths for their crowded tabby cabins. Instead, she’d explain what they did do. And then immediately, she’d be on to a story of how she watched her mother’s and grandmother’s contemporaries gather the plant, along with others that were used as medicinal remedies. And she’d throw in the botanical name (Cynoglossum officinale) for good measure. Cornelia talked a great deal—at her kitchen table, while conducting tours of her Sapelo Island home for the state and her family business, at zoning meetings, or at the podium while on book tours. She had a great deal to say. In fact, when I held my first Sea Island Writers Retreats at her Wallow Lodge in front of her home on Sapelo in 2004, she would trade her businesswoman’s hat for a raconteur cap and regale my writing students with the tales of her island. She spoke of “dying” at age three; of contracting a high fever which no amount of herbal remedies applied by her frantic mother Hattie Bryant Walker alleviated; of falling into a coma-like state in which no one could discern breath or life in her little body. Her family pronounced her dead. Her father Hicks Walker measured his baby girl for a little pine box made by the island carpenter Freddy Wilson. But just as they were heading for the cemetery, Cornelia’s aunt Mary, her mother’s sister, pulled in on a horse and wagon from her community of Raccoon Bluff and examined the child. At first Mary sadly agreed there was no signs of life. But a small inner voice said different, and Mary got to work. She ordered garlic be pulled up from a nearby garden. She then crushed the pungent cloves and packed the still child’s nose with it. Moments later, according to family lore, little Cornelia made a little sound. Then, a sneeze. She was back from the dead. Cornelia told this story often. For her, it illustrated the importance of belief in home remedies and in the Spirit to the Geechee-Gullah community. From that day of “resurrection,” she said, she saw things, heard things, and knew things. She said she didn’t want that gift, but it was hers. It was her mission to protect and honor her family’s culture. Cornelia saw herself as an apostle, a fervent believer in her Geechee-Gullah heritage and of Sapelo, which is one of the last remaining bastions of the unique African American culture. She lectured, published, and spoke the history the African slaves who lived and worked the cotton, sugar cane, and rice fields of Thomas Spalding’s plantation throughout the 1800s. After the Civil War, many of those once-enslaved people bought land on the island where they had toiled. And thanks to its isolation from the mainland, they were able to keep their crafts, belief systems, language, customs, and culture largely unchanged. Cornelia was born and grew up in one of those communities, Belle Marsh, in 1945. Her father Hicks was known for his crafts, especially the intricate art of weaving the sweet grass that grew in protected spots on the island into baskets that were both utilitarian and beautiful, and for the stories he told of old times on the isolated island. She kept this tradition alive by teaching the same skills to her children—two daughters and five sons—along with cast net knitting, herb collecting, and the secrets of midwifery, in Hog Hammock, the community she moved to in 1966. In fact, when I first met her sons in the 1980s at the annual Sea Island Festival, they were dutifully demonstrating the crafts of fishnet making, casting, and building bateaus, a type of flatboat. In the spirit of community, of “it takes a village to raise a child,” she also parented several foster children and her own grandchildren with her husband of 54 years, Julius (whom she called “Frank”). She fought with all her spirit against the forces that sought to change and eradicate the culture that birthed and nurtured her and her community—rising taxes, burgeoning development, dwindling island population, fading history, aging residents. 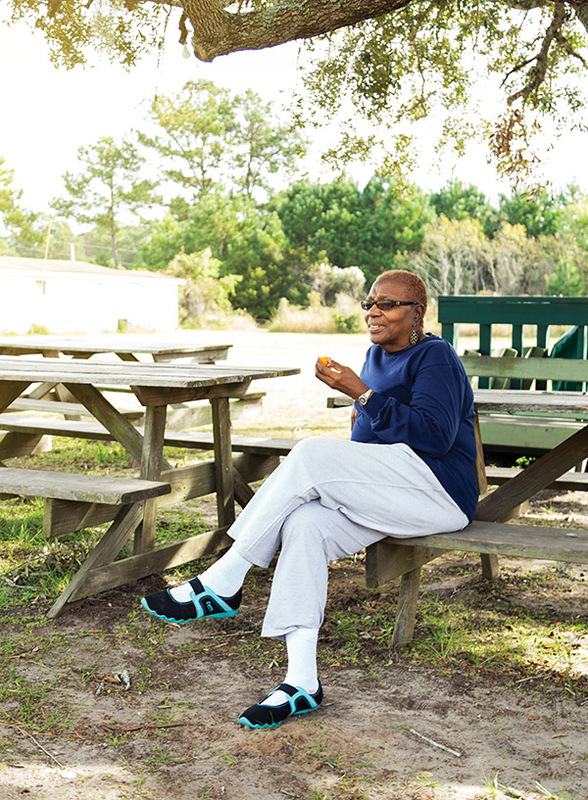 She had seen the number of Sapelo Island’s black communities shrink down to one. And she feared even Hog Hammock was headed for extinction. Her tools were the force of her personality and the power of her voice. She agreed with fellow Georgia-born writer Alice Walker that speaking out was the path to possessing the secret of joy. For Cornelia, the fight to honor and preserve Sapelo Island and its culture, a culture that touches nearly all of us of African descent in this country, was as personal as it gets. Cornelia was one of those rare Americans who could trace her ancestry back to one specific African ancestor, Bilai, a Muslim man who was both enslaved and free on Sapelo during the 1800s. Bailey was proud of that connection to her past (if not always of her ancestor, who was deemed suspect because of the authority he was given by the plantation owner, an authority he held over other slaves) but to her people, to Africa. She was able to see the importance of an ancestral connection right along with reality of the harshness of Southern slavery. When she traveled to West Africa in 1989, exchanging her Sapelo Island home for the dirt of Sierra Leone, she saw first-hand the links to Sapelo’s slavery—the similarities in how beans were cultivated on poles, sweet potatoes planted in straight lines—separated by an ocean and a story. She always talked of the ways her African relatives and her Hog Hammock neighbors both baked with benne seeds. She said she could not walk through a village there without noting how building construction techniques mirrored those she had seen all her life on Sapelo. How the children would scare the ravenous birds from the rice crops in the same way her father did when he was a child. The trip made the isolated enslavement of her people on the Georgia coast more real and present than she could have imagined from her view from Sapelo. It was this new vision of Geechee-Gullah connection, seen in the faces at the markets that reminded her of family back home, in the aroma of the smoked fish that reminded her of Sea Island smoked mullet, that cemented her resolve to continue her activism for the survival of her home’s culture. In 1993, she co-founded the Sapelo Island Cultural Revitalization Society (SICARS) with president and friend Inez Grovner, and the subsequent Annual Culture Day held in October on the island, both dedicated to the mission of preserving Hog Hammock. In 2000, she published her first of two books, memoir God, Dr. Buzzard and the Bolito Man: A Saltwater Geechee Talks About Life on Sapelo Island, where she wrote “I am a storyteller. And our tale is so private our story has never been told before.” She was officially honored for her activism and work with the Governor’s Award in the Humanities in 2004. Cornelia talked openly of her wishes to keep Sapelo an authentic black community, not a vacationers’ haven of white folks with money. But she also wanted Sapelo to thrive. She had recently been at the forefront of the Geechee Red Peas Project, an effort to revive the stature and demand for a little local vegetable that would give islanders a way to bring profits back to Sapelo. On October 15, 2017, Cornelia died at age 72. Now there is one question on the minds of all who followed her life’s work of protecting and promoting the Georgia Geechee-Gullah culture: who will take up her banner? Her compatriots at SICARS are certainly as committed and fervent as she was. Her children and grandchildren certainly were shown and taught their history and place in the firmament just as she was. Other families on Sapelo, old and new, certainly appreciate the island’s unique standing and are equipped and eager to see Bailey’s work continue. But there was only one Cornelia Walker Bailey. On a pristine fall day, the Saturday after her death, Cornelia’s steel grey casket, covered in a blanket of pink, mauve, lilac roses, was lowered into the sandy Sapelo Island dirt, next to dozens of Walkers and Baileys who proceeded her. One could not help but be consoled that a giant—in culture, letters, stories, crafts, history, activism, and life—was now truly lying with the ancestors she worked so hard to protect. Tina McElroy Ansa is a writer, workshop leader, and author of five novels. She has lived on St. Simons Island with her husband, filmmaker Jonee’ Ansa, for 33 years.